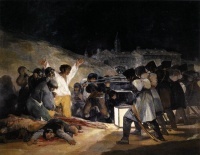 The Dos de Mayo of 1808, was a rebellion by the people of Madrid against the occupation of the city by French troops, provoking a brutal repression by the French Imperial forces and triggering the Peninsular War. Unless indicated otherwise, the text in this article is either based on Wikipedia article "Dos de Mayo Uprising" or another language Wikipedia page thereof used under the terms of the GNU Free Documentation License; or on original research by Jahsonic and friends. See Art and Popular Culture's copyright notice. This page was last modified 21:32, 28 January 2014.